The five-storey Art Nouveau building (Budapest, 1065 Nagymező utca 8., designed by Gyula Fodor, 1911), was exemplary renovated in interior. We present here some of the details from this prestigious building. The Szevera house (architect Ernő Schannen) was built around 1896. 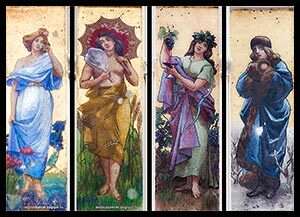 On the facade four large mozaics, was made a little later in Art Nouveau style: the allegories of the four seasons. This late Art Nouveau styled house and department store is designed by Samuel Revesz and Joseph Kollar between 1910 and 1912. In the facade structure's design and his reliefs decoration Jugendstil effect can be seen. Is characteristic the geometric decoration of plants and human figures. 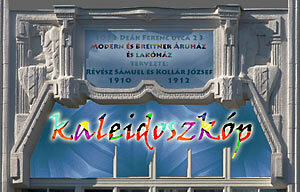 Editor of the blog CheckMyBudapest offered this article for The Art Nouveau World Day, 2013. We can see the appraised building from a very different angle. We also provide you with Odon Lechner drafts and old photographs of the building. 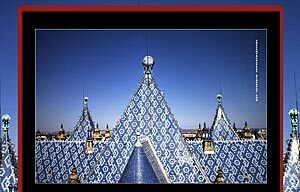 This is the part of the building that Odon Lechner would probably redesign at a later time, however today; it is a masterpiece, which is often avoided by the passer-bys of the museum. It`s worthy to observe, it equals to an exhibition. We present to you one of the most beautiful Art Nouveau town houses of Budapest, the Szenes-haz (Szenes house - 1905-06). Titusz Puha urged the display, and provided us with some of his photos as well as other images. There is only little known about the architect of the house, Istvan Nagy as of the house itself.